I noticed recently that Google+ for Local Businesses now allows you to enter up to 10 categories for a business. This is a big change that greatly affects your opportunities to rank on Google maps and local. I’ve made notes to update this on all our local clients and have already done so on a few (including our own company) and the affect is immediate. This actually makes an immediate impact for the specific categories you’re listed in and related combinations. For example, I was able to add our business to “marketing agency” and “advertising agency” and a bunch of other related categories. 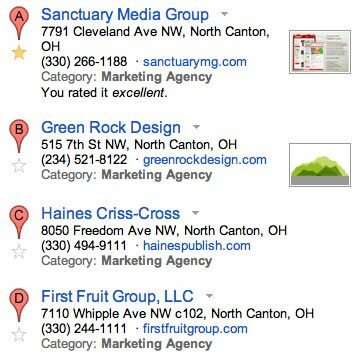 Try doing a search on Google maps for your business terms without a local modifier and see if you come up to the top. We now do which is amazing and it was so easy to do. The same thing works for combinations of terms too. For example, internet marketing is a category. If you combine terms like internet marketing with “agency” it works too. I just wish that maps was called “local” or that it was more consistently integrated as local search results. Regardless, maps results show up in a lot of places and on mobile so it’s just another easy way to improve visibility. Log into your Google account now and make sure that you have all of the categories selected. The update will happen within 15 minutes and you’ll be ranking for a wider range of related terms!